In my last column, I explained how to use SEMrush to find featured snippets (also called direct answers) that Google is surfacing for your domain. Since they are typically highlighted at the top of the search results, featured snippets can drive a lot of targeted traffic to your site, while also building credibility. Featured snippets take up a large amount of real estate; they can provide a series of bullets with information and also contain a link to find out more from the destination website. Needless to say, this can attract a lot of eyeballs and clicks. Now, imagine you have a featured snippet, and a lot of traffic is being sent to your site on a regular basis (and your site is advertising-driven). Imagine that Google is providing that featured snippet for an extremely competitive keyword — one with hundreds of thousands of searches per month. Traffic is strong, ads keep rolling and life is good. But one day you notice less traffic to the site, and specifically to the landing page being surfaced by Google via that featured snippet. Upon digging in, you realize the unthinkable has happened: another site has taken your snippet. My post today provides a case study about a client of mine that had a featured snippet for a high-volume keyword and ended up losing that snippet to a website that came out of left field. The competitor hadn’t been ranking well at all for months leading up to the featured snippet change, and then boom — it was given a featured snippet for an ultra-competitive keyword. Since we are seeing more and more featured snippets in Google, I wanted to dig into the situation to analyze the loss of a featured snippet. So I compared a number of factors associated with each page and domain to see what I could find. That included analyzing content quality, page structure, inbound links, social metrics and more. The story and my findings are below. I explained earlier that the query is a competitive one. Analyzing a two-week period after losing the snippet revealed a drop of 39,254 clicks to my client’s site. So yes, featured snippets can drive a lot of traffic, and this was an important snippet for my client. My client received the featured snippet in January of 2015 and held on to that spot for most of the time between January and mid-May. That is, until they got blindsided by a newcomer. A relatively unknown website jumped into the top ten for that keyword, basically out of the blue — and then it wasn’t long after jumping into the top ten that they received the featured snippet and pushed my client’s URL out of the spotlight. It would be like Peyton Manning battling Andrew Luck for the starting quarterback position, and then high school quarterback Jimmy Harris arriving before the first game and taking the starting spot. Nobody saw this coming. The featured snippet swap occurred right after “Phantom 2” rolled out in early May 2015. I don’t know if that had any impact on the snippet, but it’s entirely possible. Phantom 2, also called “The Quality Update” was a change to Google’s core ranking algorithm in how it assessed quality. Checking the traffic history of the competitor’s domain shows a jump starting in May and increasing in June — so it does seem that Phantom 2 could have had something to do with the change. Needless to say, I was eager to dig further into the situation. So how far out of left field did this competitor come? Very far. According to SEMrush, the competitor wasn’t even in the top 20 for the query in January, February, March or April of 2015. After that, you can see the first signs of the page rising in the ranks. In early May, it broke the top 20 and ranked #14, only to jump into the top 10 and nail the featured snippet and a #2 ranking soon after. It’s important to note that my client still ranks #1 organically for the query but doesn’t have the featured snippet. The competitor that now has the featured snippet ranks #2 organically, below my client’s URL (but has the featured snippet at the top of the page). Yes, that can happen. So my client’s URL still ranks extremely well, but the featured snippet was swapped out algorithmically. My goal was to figure out why that happened. Was it Phantom or some other factor that led to the switch? Let’s dig in. Now that a newcomer quickly jumped in the rankings and won a featured snippet, I thought it would be a good idea to compare my client’s page to the new page. I wanted to see how each URL matched up when reviewing a number of factors. So I looked at content quality, inbound links, page structure, technical SEO, social data and more. I have provided my findings below, followed by some recommendations based on my analysis. After my client lost their featured snippet, I wondered if page structure had anything to do with it. I’m not necessarily referring to structured data, but rather how the page’s HTML and content were structured. Neither page uses structured data at all, so I knew that had nothing to do with this featured snippet getting swapped out. I took a closer look at how the content was structured on the page. Each URL has content that provides a number of recommendations, and there was a clear difference in the way the content was structured on my client’s page versus the newcomer’s page. My client’s page was basically paragraph-driven (in HTML). Even though the page provides a list of recommendations, an ordered or unordered list was not used. So you can think of this approach as a blog post that simply includes a list of recommendations. But the newcomer took a different approach. The page provides named anchors at the top of the page which jump users down to each recommendation when clicked. First, that’s good for users, as it’s a more organized approach that’s easier to traverse. Second, it enables Google to jump to answers directly from a specific tip (via links at the top of the page). Next, the recommendations are provided as part of an ordered list in HTML. Again, this is a more organized approach for providing a list of recommendations. Also, the heading structure was strong. For example, the h1 was the title (which matches the query most people enter when the featured snippet is triggered). Then, each recommendation was enclosed in an <h2> tag. Now, I don’t know how much weight the page structure has when determining which URL to surface in a featured snippet, but the difference in this example was clear. One page was organized well, while the other was less structured. As I explained earlier, neither URL uses structured data, so that had no impact on the loss of the featured snippet for this case. But that doesn’t mean you shouldn’t use structured data. I contacted Aaron Bradley, who focuses heavily on semantic search technology, to better understand which schema types and properties might apply to questions and answers. Aaron explained that although he hasn’t set this up or tested it yet, the Question and Answer schemas make a lot of sense (although it seems that both types were intended for an upvoting system like what’s used on Quora or Stack Overflow). Aaron also explained that for multi-step answers, you could skip using Question and Answer and use ItemList instead. A simple example is provided below. This should be what it’s all about, right? How good is the content, and how helpful is it for users? Sure, other factors could play a part in receiving a featured snippet, but Google should be looking to surface the best answer possible. Let’s see how the URLs compared. Both pages contain a solid set of recommendations based on the topic at hand. Both contain a number of tips and recommendations that address the core question being searched for. Sure, there are some questionable recommendations (based on different approaches in this niche), but overall, the content quality is high for both URLs. Also, the authority of an author (as a potential ranking metric) has been hotly debated, especially since authorship snippets were removed from the SERPs last year. We know that the loss of SERP snippets doesn’t necessarily mean that Google stopped paying attention to some form of Author Rank, but how much does that affect rankings? I don’t know the answer to this question, of course — but for this example, I suspect that the author being highlighted in the post is helping. That’s just my gut feeling. Content Quality Continued: Is Fresh Best? The new URL that now has a featured snippet provides a “last updated” tag at the top of the page with the most recent date the article was updated. With Google wanting to provide the latest information for this topic, highlighting the date that the post was last updated is a good idea. I can’t say how much this is affecting receiving a featured snippet, but it sure can help users (and Google) understand that the content is fresh. Does Aggressive Advertising Have An Impact? My client’s site is advertising-driven, while the competitor’s website is not. My client is wedging ads in between parts of the article (woven in between the content), while the newcomer doesn’t have a single ad on the page. It’s an interesting observation, since we know that interrupting the user experience with ads woven into content can frustrate readers and can even deceive them (if they end up clicking ads they thought were part of the article). We also know that Google has made moves to discourage sites from putting too many ad placements above the fold. I can’t say for sure if ad issues had an impact for this specific featured snippet, but they very well could have. When reviewing both pages, it was also easy to see the difference in user-generated content. The newcomer has more than 600 comments on the page, while my client’s page doesn’t provide commenting at all. Could Google be looking at the overwhelming difference here and surfacing the newcomer partly based on the amount of user engagement (via commenting)? Hard to say, but again, there was a stark difference between the two pages. After checking page structure and content quality, I compared both the URL and the domain to see how much weight inbound links had with regard to featured snippets. In a nutshell, the two URLs were historically similar (across most metrics). But my client’s URL had a higher Trust Flow (TF) according to Majestic, meaning that it has gained inbound links from more trusted sites than the newcomer. The competitor’s URL has 4,037 links from 408 domains with a Trust Flow of 14 and a Citation Flow of 36. My client’s article has 3,973 links from 467 domains with a Trust Flow of 45 and a Citation Flow of 39. Velocity-wise, it looks like both URLs had built links steadily over time. There were no spikes in each backlink history. Based on what I found across link analysis tools, both URLs had similar metrics, but my client’s URL had more trusted links. So, from a links standpoint, there was no apparent reason that the newcomer’s URL should have received the featured snippet and pushed my client’s URL out. My client actually had the advantage due to having more trusted links. And from a domain standpoint, my client has 8M inbound links with a Trust Flow of 67 and a Citation Flow of 43, compared to 940K links with a much lower Trust Flow of 19 and a Citation Flow of 35 for the newcomer. So again, it’s hard to say links had anything to do with the featured snippet change. Both URLs are mobile-friendly, according to Google’s mobile-friendly test tool. That said, the winner has some rendering issues and is blocking certain files from being fetched. The screenshot doesn’t exactly look so hot via the mobile-friendly tool, but again, the page passes the binary test. It also renders fine during my tests using several mobile devices. So it seems both URLs pass the mobile-friendly test, and both render fine via mobile devices. I’ll call this a draw. Social Metrics — Does Sharing Correlate Strongly With A Featured Snippet? Let’s talk social for a minute. Sure, social is not a ranking factor, but it can indirectly influence SEO. The more times a post gets shared, the more eyeballs it gets in front of. More eyeballs can translate to more engagement, including some people searching for that post via Google. And the more people find a post, the more opportunity the page has for building links. So although many more people have shared my client’s post, social activity did not correlate highly with retaining a featured snippet. While analyzing the situation, I started to wonder how much domain authority played into the display of additional featured snippets. For example, if Google trusted a domain enough to display several (or many) featured snippets, would it be easier for that domain to gain (and then retain) more? I dug into each website via SEMrush using the technique I provided in my last column to see how many featured snippets were being surfaced for each domain. It turns out that my client’s website crushes the other website when it comes to “how-to” queries and featured snippets. It wasn’t even close. I’m seeing 7,800+ how-to queries leading to my client’s site, while the competitor has just 483 — and when digging into those queries, I found my client’s site receiving a number of featured snippets. I didn’t check all of the keywords, but I saw enough featured snippets during my research to know the domain is trusted. Other than the one featured snippet I’m referring to in this article, I couldn’t find a single additional featured snippet for the newcomer. It seems clear that a domain having many other featured snippets doesn’t necessarily correlate to gaining or retaining more featured snippets. 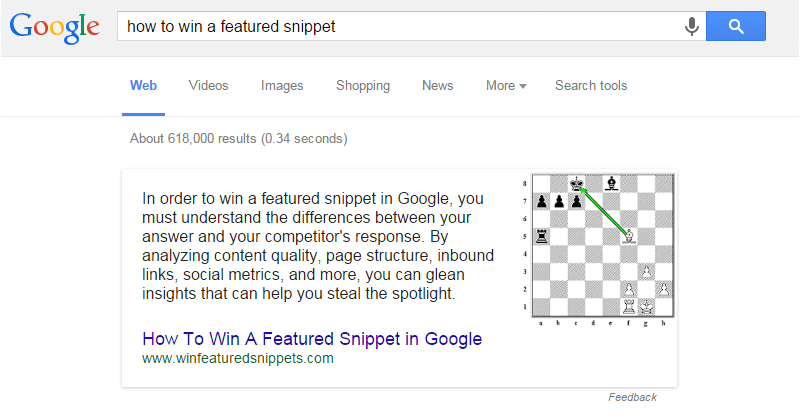 The newcomer came out of left field without any other featured snippets and won the battle. My client’s site has run into some technical issues over the past few years, and they have been struggling to fix those problems. That includes performance problems, rendering issues and mobile problems. The issues are tough to track down, since they occur inconsistently. And when they do pop up, they cause big problems from a user experience standpoint. It’s one of the reasons my client is migrating to a new technical infrastructure soon. Now, it’s impossible to say if the technical issues caused Google to remove their featured snippet for this query, but it’s entirely possible. If Google sees that a page won’t load properly (or at all in certain situations), then the featured snippet for that site could be removed algorithmically. It would be horrible for users to see a featured snippet in the SERPs and click through, only to run into serious problems reading the rest of the article. Again, this is just speculation, and I might reach out to Google to see if they could shed some light on the situation. I’ll update this post if I learn more. Based on my analysis of the situation, I have provided a list of recommendations below for gaining and/or retaining a featured snippet. Although only Google knows how this works algorithmically, the following bullets could possibly help you retain your featured snippet(s). Highlight the author. And that’s especially the case if it’s a subject matter expert. Authorship has been removed from the search results, but Google probably still focuses on some aspect of Author Rank. If you are providing a list of recommendations (or steps), use an ordered list in HTML. And you can use named anchors at the top of your article jumping users to each specific list item. If users will be looking for the latest information about a subject (fresh content), then provide a “last updated” tag on the page. If it’s content that benefits from current information, doing this can help Google (and users) understand when the post was last updated. If the author can keep contributing to the post, then open up comments. The post that took over my client’s page for the featured snippet had 600+ comments. Remember, according to John Mueller, comments can help make up the content of your page, so moderate heavily. Only allow comments that provide value, and try to bubble them up to the first page. 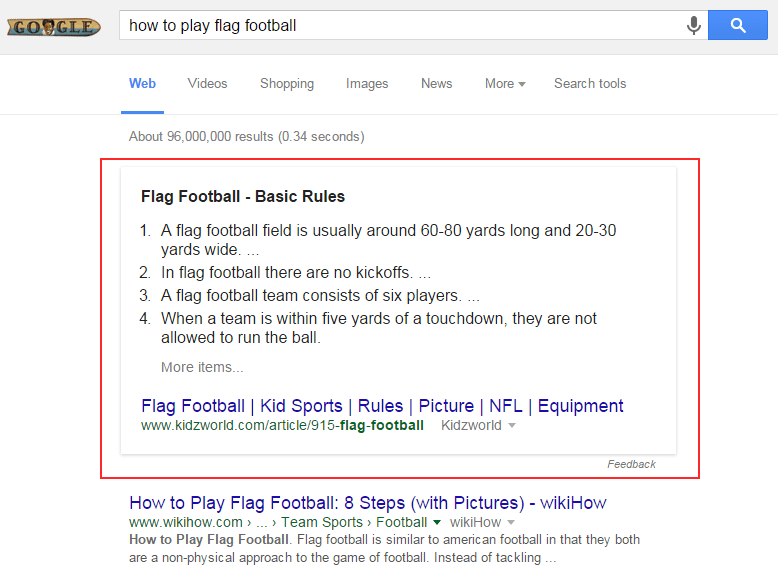 Use structured data to mark up your page holding the question and answer. I covered this earlier in the post, but using Question, Answer or ItemList could work, based on the specific content you provide. I recommend reviewing schema.org to learn more about each type and their associated properties. Moving forward, my client plans to implement changes to the page that lost the featured snippet based on my analysis. I don’t know if those changes can bring back the featured snippet, but we are going to try. And for those of you with featured snippets now, it’s important to understand that they can go away. And the site that steals the spotlight might appear from out of nowhere. That’s exactly what happened to my client. I recommend focusing on your featured snippets now to preempt the loss of that snippet by a competitor. A lot of traffic might be on the line. Don’t lose it.